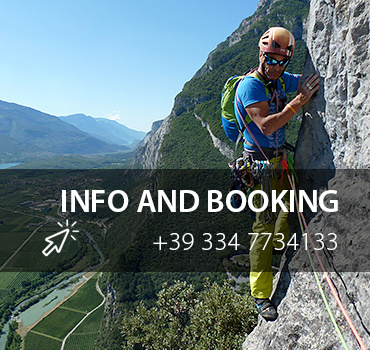 Three days on the extraordinary limestone walls of the Sarca valley to discover this fantastic sport. Flanked by an Alpine Guide who will reveal all the tricks of the trade to discover the vertical dimension. The course is addressed to those who approach this discipline for the first time or are the first experiences on the wall. The purpose of the course is to provide the necessary skills for a first partial autonomy of the participants. For this reason we will deal mainly with topics related to the insurance of the climbing partner, the correct use of technical materials and the fundamental nodes. In addition, the main climbing progression techniques will be taught and, if you feel like it, you will also be able to try lead climbing. Equipment provided by Mountime: harness, helmet (if necessary) and climbing shoes. Personal equipment: sports clothing, trekking or sport shoes, backpack with water and snaks.